SALT LAKE CITY (AP) Donovan Mitchell made the most of his opportunity in place of the injured Rudy Gobert. 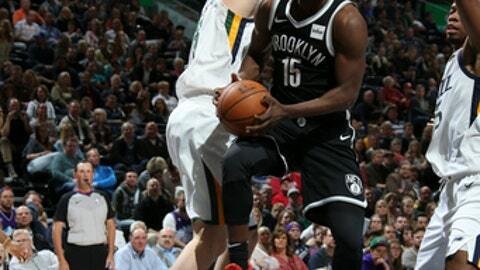 Mitchell scored 26 points, including four in the final minute, to lead the Utah Jazz to a 114-106 win over the Brooklyn Nets on Saturday night. Without Gobert, who sat with a bruised knee, Derrick Favors had season highs of 24 points and 12 rebounds and the Jazz snapped their four-game losing streak. Favors himself played with a balky knee last season but feels like he’s fully healthy now. ”My first intention was to dunk it but the defender backed up a bit and I had to tip it in. I didn’t even know it went in at first,” Mitchell said, although the roar of the crowd told him all he needed to know. ”I felt like in the second half we came out more together, focused, more locked in. It showed in our play. Obviously, we’re hurt about the loss, but on a good note we competed and were more locked in at the end,” Hollis-Jefferson said. Nets: Trevor Booker returned after missing four games with a sore lower back and supplied his typical intensity, scoring 12 points and picking up a technical in the second quarter. … Coach Kenny Atkinson said before the game, ”We’ve won a couple of road games, and now the next step is, can we perform better on a back-to-back. We’ll see.” … The Nets still haven’t won consecutive road games since the 2015-16 season. Jazz: After Friday’s game, Gobert tweeted a video of the play, saying, ”Dove for the ball right…” and also told reporters he thought Dion Waiters crashing into his knee was a dirty play. … The Jazz haven’t topped the 50-percent mark for field goal percentage in a game since the opener against Denver but came close with 48.2 percent. With Jeremy Lin out for the season and Spencer Dinwiddie hampered with hamstring issues, an extended absence for Russell would be a big blow to the Nets. The team’s leading scorer at 20.9 points a game landed awkwardly on a drive to the hoop. He went to the sideline and paused there for a bit before slowly walking to the locker room. The Nets say Russell will be evaluated on Sunday. Nets: Host Boston on Tuesday night. Jazz: Host Minnesota on Monday night for their eighth home game in the last nine.